After years of swimming T-Bay, I’ve gotten to know it reasonably well. A few years back I drew up a map of the pertinent features, from a swimming point of view. That map is a bit out of date, I’ve made a few discoveries since then, but I just keep it in my head now. 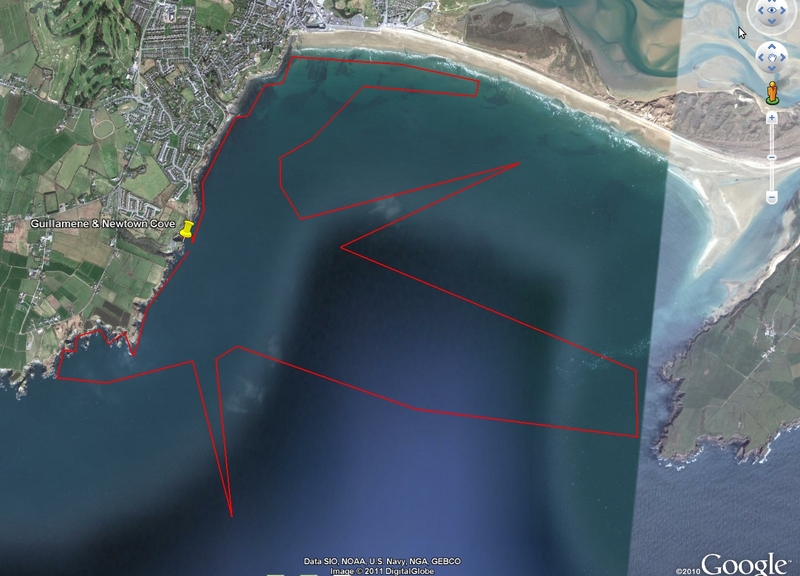 Anyway, having swum into and out of, new parts of the bay this year, I did a quick map of my swimming “range” in Google Earth. It’s pretty extensive. The area within the red lines are the areas I’ve swum in. It doesn’t include areas down the coast that I’ve swum to from the Guillamene. I’ve tried to roughly gauge the area from many swims, though the vast majority are similar swims, between the Metalman and the pier. The two big additions this year are the spiky area pointing down and the spiky area out to the upper right. The area across the bay to Brownstown is from a few over and back solo swims and plenty to about half way, and a couple of one ways back from Brownstown. The spike out the upper right was an attempt to do Mo Snámh Mór Fada (over to Brownstown Head and back, unaccompanied) a few weeks back that didn’t go well. There was an onshore Force Two again. I’d never done an over and back in those conditions but wanted to try it, since I’ve done a couple of half way and back swims this year. 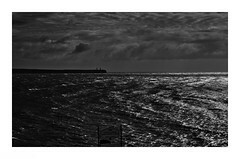 After about 50 minutes of swimming to Brownstown Head, but feeling I was not going as well as usual, I checked my triangulation off Brownstown, Newtown, the Metalman and the pier and I discovered I’d been pushed further into the bay, maybe one to one and a half kilometres off course, something that wasn’t obvious when I was only sighting forward. I’d been driven to the far inside of the bay and the beach. To make it to Brownstown would therefore have been too long. The return to the Guillamene was tough as I was then heading more back into the wind and waves. It took almost two hours in total, not hugely far off my best over and back time, but I estimate it could have taken at least anther hour, though I think in fact it would have taken another hour and a half. I very rarely abort a swim. it was interesting, I learned more from it. The spike to the bottom right was 4 to 6 weeks ago when I felt the need to get away from land altogether. It was a southerly onshore Force 2 wind on the way out, and was interesting. I’ve been out there once again since then. 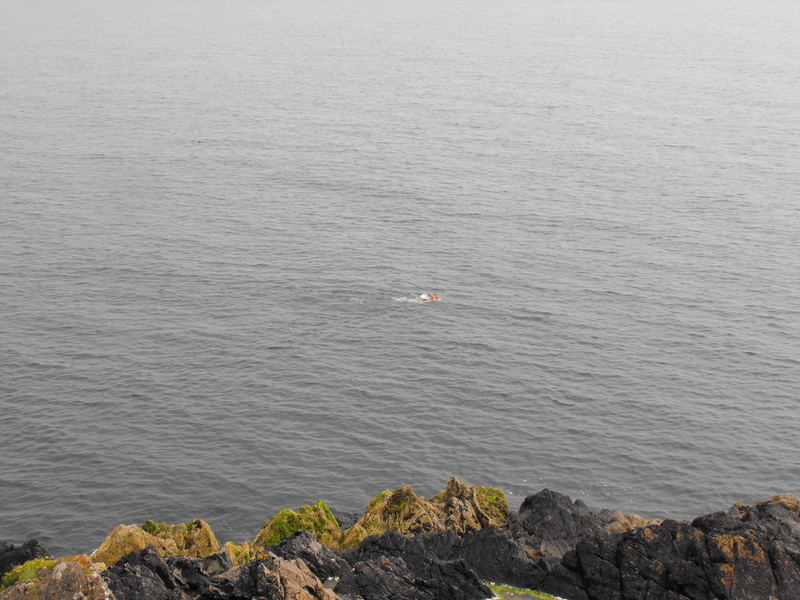 Otherwise the only things of interest are that I regularly swim quite far out from the side of the bay when swimming in and out of the pier to Metalman. A great photo Dee took yesterday. At full size, you can see four current trails from each leg and arm. It was rougher when I was returning.